When you allow for multiple field values to be selected in a SSRS report there needs to be additional logic added to the back end to deal with this. This is best explained with an example scenario. I have a table called Ireland with two columns, ID_Column and County. You can use the script below to create and populate this table. Run the query below to follow the working example. If I wanted to allow a user to select every county from the Ireland table in an SSRS report I would create a stored procedure that simply executes the following query. 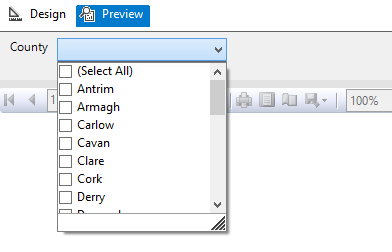 However an SSRS report which allows users to choose counties in Ireland like below means that a WHERE clause needs to be introduced and be able to respond to the field values selected. But the issue is that the SSRS report will pass the multi-valued parameter as a string with the values separated by a comma. So instead of receiving the required: ‘Antrim’, ‘Armagh’, ‘Carlow’, ‘Cavan’ etc. for use in the WHERE clause. SQL Server is passed: ‘Antrim, Armagh, Carlow, Cavan’ etc. which cannot be used. So the first additional logic and code to be added to the back end to deal with the multi-value parameter is a User Defined Function (UDF) which splits the parameter. The following function and quotations are taken from the 4guysfromrolla website. Run the query below to follow the working example. Now that the split function exits within the database it is now possible to use a Stored Procedure to SELECT from the Ireland table pulling back specific counties by way of a WHERE clause. Now that the populated table, split function and county select SP exists run the query below passing a string with multiple counties to return Dublin, Meath and Cork from the Ireland Table. You should now have returned the table with Dublin, Meath and Cork as separate row entries. And that’s it, thanks for reading.